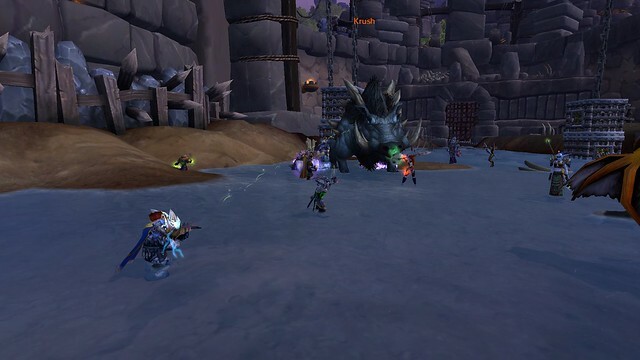 Blizzard encourages their players to interact with the game and to make suggestions. Bugs, the things which are broken, are a separate category. Suggestions are just that. "Hey, I'd like to see..." In this column, we're going to post some of our ideas. Way back in Wrath of the Lich King, we came up with the idea for socks, which showed up this past year as a gift from Greatfather Winter. We can't claim credit for the socks, our idea was more of an item you would have tailors make, but we were really excited when socks showed up in the game. That's Krush, the boar outside The Butcher in the Highmaul Raid in Warlords of Draenor. Every time we head over to The Butcher, we make the observation that there is no bacon of quantity in this game. You can make Beer Basted Boar Ribs and three types of boars in the game drop ribs used for quests. There is the quest in Hellfire Peninsula, Hellboar, the Other White Meat, which gives you a stack of Hellboar Bacon, but, because it's a quest, it's not repeatable. We feel the lack of bacon in this game is an egregious oversight and needs to be rectified. Look at the size of that boar. We could get, easily, enough meat off that guy to satisfy a raid group for at least 30 minutes. Come on Blizzard. We have eggs. Let's have bacon.